Sharia is an Arabic word, literally meaning “the right path”. It commonly refers to the traditional Islamic law, derived from the religious precepts of Islam, particularly the Quran and the Hadith. Islamic law or the Sharia is, therefore, the expression of Allah’s command for Muslim society. In practical application, it does constitute a system of duties that are compulsory. The law itself represents a divinely ordained path of conduct that guides Muslims towards a rational expression of their religious conviction in the world as a whole. Additionally, it guides them towards the goal of divine favor of the world. Muslims believe that Allah (God) revealed his true will to Muhammad, who then passed on Allah's commands to humans in the Quran. Islamic law represents one of the world's most prominent and important legal systems. Like Judaic law, which influenced western legal systems, Islamic law originated as a key element of Islam. Since Sharia law originated with Allah, it is considered to be sacred itself. Between the seventh century marking Muhammad death and the tenth century, many Islamic legal scholars attempted to interpret the Sharia to adapt it to the expanding Muslim Empire. In the modern era, the influences of the Western colonialism and their law systems generated efforts to codify Sharia. It became clear, that there needed to be comprehensive reform of Islamic law. The traditional Sharia law is currently adapted to meet the changing circumstances in the modern Muslim society. However, there is a specific reason behind this change, and it should be sought in two principal respects in which the Sharia differs from Western law systems. The second significant distinction between the Sharia and Western legal systems is the result of the Islamic concept of law as an expression of the divine will. The line between the religious and secular obligations is not as well-established in the Muslim world, as it is in the Western countries. In the United States, there is a clear distinction between church and state that is written into the Constitution, but this distinction is not as defined in Islam. With the death of the Prophet Muhammad in 632, communication between the divine will and the human beings ceased. That fixed the very terms of the divine revelation and made them entirely immutable. Thus Sharia law became a rigid and static system. Furthermore, unlike the secular legal systems that grow out of society and change over time, Sharia law was forced and imposed upon society “from above.” Because in Islamic jurisprudence it is not the society that molds and fashions the law but it is the law that precedes and controls society instead. The first Muslim community established under the leadership of the Prophet Muhammad at Medina in 622, the Quranic revelations laid basic dawn standards of conduct. But the Quran is in no sense a comprehensive legal code. No more than 80 verses deal with strictly legal matters. Their general effect is to modify the existing Arabian customary law in certain important particulars. During his lifetime Muhammad served as the supreme judge of his community. He resolved legal problems as they arose by interpreting and expanding the general provisions of the Quran. This activity was carried on after his death by the caliphs of Medina. The first caliphs from the Umayyad dynasty took control of the empire in 661 and conquered territories outside Arabia. The Caliphs gradually incorporated elements of Jewish, Greek, Roman, Persian, and Christian church law into Sharia law. The Umayyad caliphs were the first to appoint Islamic judges, qadis, to decide cases involving Muslims. Knowledgeable about the Quran and the teachings of Muhammad, qadis decided cases in all areas of the law. 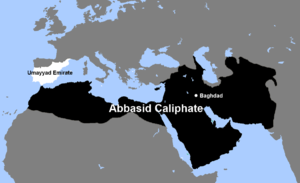 The Abbasid Caliphate in 755. In 750, the Abbasid dynasty was created after they overthrew the Umayyads. During the 500-year rule of the Abbasids, the Sharia matured. Under their absolute rule, the Abbasids transferred substantial areas of criminal law from qadis to the government. And although the qadis continued to handle cases involving religious, family, property, and commercial law, the Abbasids encouraged legal scholars to further debate the Sharia vigorously. As a result, a group of scholars started claiming that only the divinely inspired Quran and teachings of the Prophet Muhammad should make up the Sharia. Another separate group, however, argued that the Sharia should also include the reasoned opinions of qualified legal scholars. Thus different legal systems began to develop in the various provinces threatening to separate Sharia and Muslim community with different legal interprets. To eliminate discordant views, the Abbasid vigorously sought to reconcile the rival views. A legal scholar named Shafii became a primary force in systematizing and developing what was called the “roots of the law” at the time. He criticized both what he called “people of reason” and “people of tradition” trying to prove that neither group is true to Sharia. Shafii argued that in solving a legal question, the qadi or government judges should first consult the Quran. If the answers were not clear there, the judges then should refer to the authentic sayings and decisions of Muhammad. If the answers continued to elude the judges, they subsequently should follow and refer to the consensus of Muslim legal scholars on the matter. Still failing to find a solution, and as a last resort allowance, the judges could form their answer(s) by analogy from “the precedent nearest in resemblance and most appropriate” to the case in hand. Faced with contradictory traditional interpretations of Sharia law, Shafii’s approach quickly gained adherents and was later widely adopted throughout the Islamic world. By the year 900, the classic Sharia was formed and established. Although some concepts and institutions have developed since that time, Shafi's understanding of Sharia law ground these new developments. Additionally, Sharia law has taken its place at the primary law governing the behavior of Muslims. 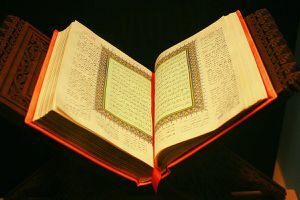 The process was backed up by unified handbooks with examples, assembled by Islamic specialists in the law and prepared for Islamic judges to use in their decision makings. Moreover, the classic Sharia was not a code of laws, but a collective body of religious and legal scholarship that generally ceased to develop for the next 1,000 years. ↑ Hadith represents a collection of reports claiming to quote what the prophet Muhammad said on any matter verbatim. This page was last edited on 4 January 2019, at 16:47.